Scientific communication is one of the most challenging aspects of volcanic risk management because the complexities and uncertainties of volcanic unrest make it difficult for scientists to provide information that is timely, relevant, easily comprehensible and trusted. When poorly handled, scientific communication can cause social, economic and political problems, and undermine community confidence in disaster management regimes. This is the first of two related papers that together investigate the interface between the scientific consideration of volcanic hazards and the governance of volcanic risks. Both papers are principally concerned with issues of risk governance, and their focus is hazard communication by volcanologists at this hazard-risk interface (the interface) during periods of volcanic unrest. In this paper, we argue that the working practices of contextualisation must be more methodical and propose four quality assurance standards that will enhance hazard assessments. 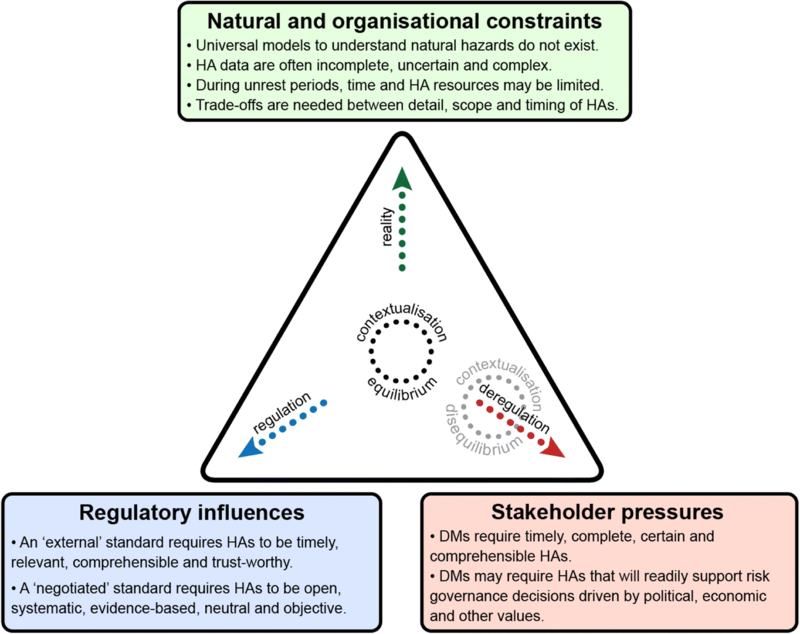 To improve hazard communication between volcanologists and risk-mitigation decision-makers (decision-makers), we argue that volcanologists need to adopt a more iterative and structured approach that openly embraces the benefits, and confronts the challenges, of stakeholder-orientated ‘contextualisation’. Our analysis of the published literature reveals evidence of a slow paradigm shift from practices based upon strict linear technocratic approaches to more iterative stakeholder participation. The extent of this shift varies in different regions, however, the rules and practices of deliberation often appear ad hoc and unstructured. Since there is currently insufficient guidance for managing the practicalities and standards of contextualisation, we introduce two novel concepts; the ‘scrutiny dimension’ of risk governance, which is the slow changing governance context that may influence the processes of contextualisation, and the dynamic ‘equilibrium of contextualisation’, which is the metastable product of regulatory standards, natural and organisational constraints, and stakeholder pressures. We argue that the working practices of contextualisation must be more structured and should strive to be open, transparent and fully articulated. Contextualisation, which meets proposed quality assurance standards of materiality, proximity, comprehensibility and integrity, will enhance hazard assessments and, thereby, the utility of their outputs. In our second paper (Bretton et al, J Appl. Volcanol. DOI 10.1186/s13617-018-0079-8, 2018), the focus is directed away from the perceived qualities of more ‘socially robust’ hazard assessments towards the actual process of contextualisation. This is the first of two related papers1 that together investigate the interface between the scientific consideration of volcanic hazards and the governance of volcanic risks. Both papers are principally concerned with issues of risk governance, and their focus is hazard communication by volcanologists at this hazard-risk interface (the interface) during periods of volcanic unrest. In this paper, we argue that the working practices of contextualisation must be more structured and propose four quality assurance standards that will enhance hazard assessments. In our second paper, the focus is directed away from the perceived qualities of more ‘socially robust’ hazard assessments towards the actual process of contextualisation. During periods of volcanic unrest, significant practical challenges of timing, relevance, comprehensibility and trust exist for volcanologists operating at the interface that was described by Jolly and Cronin (2014) as the “science-management interface”. Periods of unrest not only create uncertainty about what is happening in a physical sense but also increase demands for scientific analysis, information and advice (Johnston et al. 2002). Analysis of volcanic unrest often involves the characterisation of the physical, temporal and spatial parameters of future scenarios, with a typical analytical product being a hazard map. The overall objective is to answer foreseeable questions from decision-makers involved in risk mitigation. These questions will include multiple variations of ‘What’ (physical parameters of chemical composition, heat, size, flux, weight, speed, etc. ), ‘When’ and ‘For how long’ (temporal parameters), and ‘Where’ (spatial parameters both horizontal and vertical). Scientific communication is one of the most challenging aspects of volcanic risk management (Marti 2015) because it must address issues of both knowledge and ignorance (e.g. uncertainties, errors, absences of knowledge and other forms of non-knowledge). The issues involve: (1) aleatory uncertainty due to the inherent variability or randomness of volcanic hazards that often involve dynamic, complex and non-linear processes2; (2) epistemic uncertainty due to constraints upon our understanding, our information (e.g. inadequate or uncertain data used to drive and evaluate models), and our resources (e.g. computing or time for reflection); (3) interpretative and deliberative human processes and subjective choices3; and (4) as a result of the first three, the foreseeable possibility of legitimate and responsible scientific disagreement such as was allegedly evident during the volcanic incidents in Guadeloupe (1976), St Vincent (1979) and Mount St Helens, Washington, USA (2004) (Fiske 1984; Driedger et al. 2008; Frenzen and Matarrese 2008). When faced with scientific uncertainties and juggling societal and political pressures, decision-makers frequently request certainty, precision, accuracy and unambiguous consensus from their expert advisers (McGuire and Kilburn 1997; Paton et al. 1998, 1999, 2000; WBGU 2000; Aspinall 2011; Donovan and Oppenheimer 2012; Jolly and Cronin 2014). The implications of the preceding discussion, however, are that no representation of a volcanic hazard can be entirely certain, precise, complete, simple or objective. Furthermore, the stakes for at-risk communities are high, given that communications of scientific knowledge, when poorly handled, can cause social, economic and political problems, even if the identified hazards do not lead imminently to physical consequences such as an eruption (Johnston et al. 2002). There is thus a constant risk that community confidence in disaster management regimes could be undermined (Christie et al. 2015). Contextualisation is the term used in this paper to describe the critical process of interactions between volcanologists and risk governance decision-makers and, specifically, the tailoring of hazard assessments to ensure they are driven by the needs of decision-makers. We start from the contention that effective contextualisation is achieved when volcanologists provide timely hazard assessments that are relevant, easily understood and trusted. Furthermore, our investigation of communication practicalities was conducted at an important moment – the immediate aftermath of the L’Aquila trial and during a period of evolving international law norms and disaster risk management initiatives. We hypothesise that the L’Aquila trial identified a failure of contextualisation within a risk governance process and we argue in this paper that volcanologists need to adopt an approach that openly embraces the benefits and confronts the challenges of contextualisation if they are to improve hazard communication at the interface. For the sake of brevity and clarity, we draw upon the existing rich discourse on relevant terminology and adopt the working definitions in Additional file 1. Differentiate in both theory and practice between the overall governance of the risks associated with natural hazards (risk governance), and those parts of risk governance that require the services of volcanologists (hazard assessments). Do not seek to challenge the discourse that compares objective/innocent/science-right and constructivist/democratic/right-science approaches to risk governance (e.g. US/NRC 1996; Grabill and Simmons 1998) but argue that it is incomplete in several respects. Argue that, in the absence of readily accessible alternatives, many of the concepts and values that are currently framed principally in the context of risk governance can, and should be, used to enhance hazard assessments. Deliberately avoid use of the expression “end-users” to describe decision-makers receiving science-based services. Given that we argue in favour of the planned and integrated contextualisation of services throughout the cycle of their production and delivery (not just at the ‘end’ of a linear production process), we acknowledge the inadequacy of this misleading expression. Alternative expressions, such as “collaborators”, “co-producers” and “partners”, have other weaknesses. Assume that, in most countries, volcanologists do not normally lead risk governance efforts, but instead undertake hazard assessments and contribute hazard knowledge and, if requested, related advice. Accept the possibility of an unintended Anglo-Saxon, Anglo-USA and/or Western Hemisphere bias due to the authors’ limited knowledge of the legal frameworks operative in many volcanic regions of the world. Future investigations involving lawyers practising in, inter alia, Iceland, South-East Asia, Latin and South America, Africa, and Japan would provide helpful complementary research. Distinct approaches to communication lie at the heart of competing theories of risk governance and, if we are to arrive at a reasoned and coherent approach, we must be clear about: (1) the respective roles of volcanologists and decision-makers within hazard assessments; (2) the factors driving the quality of associations between volcanologists and decision-makers; and (3) the likely sentiments (such as confidence and trust) and actions (such as risk-mitigation decisions) within those associations. Our choices in respect of the above have a direct effect on the way we address the underlying purposes and goals of the processes and outputs of volcanic hazard analysis and thus also on the way we address the design of those processes4. We adopt an holistic approach to risk governance, accepting that it involves the convergence of physical, societal and managerial dimensions (Cardona 2004). Acknowledgement of the existence of a managerial dimension encourages identification of decision-makers and what hazard and risk knowledge they need. To provide a coherent risk governance model that recognises the paramount importance of effective risk decision-making, we adopt a weak constructivist approach after accepting a positivist conception of risk and democratic approach to cultural bias. These terms are considered in greater detail in Additional file 2 and shown in italics whenever used. In the absence of a positivist conception of risk, it would be difficult to justify the monitoring of volcanoes to produce hazard knowledge. The ambitious claim of risk is that ‘past’ parameters must be investigated because the past may enhance analyses of the present and forecasts of the future. The word ‘weak’ is critical to the very basis upon which volcanic hazards are monitored and analysed. It is accepted that such hazards exist as objective physical phenomena capable of analysis. ‘Present' dynamic parameters can and should be monitored, analysed, quantified and communicated but, since we accept that risk is a social construction incorporating physical and societal dimensions, decision-makers’ perceptions and understandings are not only relevant but also critical because they are directly related to, and will influence, their sentiments and actions. In using the constructivist actor-network approach, we appreciate that it is important to seek evidence of ‘associations’ and ‘effects’ (Callon 1986a, 1986b; Latour 1987, 1999a, 1999b; Law 1992, 1999). The effectiveness or value of a hazard communication is derived from, and is a consequence of, the actions and sentiments of its recipients – in other words - its “effects”. Consistent with the social constructivist choice that we have made, a democratic approach to cultural bias is adopted. This emphasis on the centrality of what we might call the reception of hazard communication implies that volcanologists are not entitled to claim an intrinsic status of privilege, dominance or superiority as may be assumed in technocratic and decisionist models of risk governance. Communication is also central to the iterative non-linear approach that we favour for both hazard and risk knowledge production. Effective communication requires deliberative processes, and deliberation is in turn the precursor to, and the driver of, contextualisation. We reject both realistic approaches and conventional linear governance models that do not place communication centrally within every part of the governance process. A relativist approach is preferred by us because we accept that hazard knowledge: (1) can never be either entirely objective or value free; (2) can and should be influenced by societal contexts and managerial norms within openly discussed and agreed constraints; and (3) should be the decision-maker or “audience” (Leonard et al. 2014, 227) focussed product of iterative analytical-deliberative hazard assessments. It is important to emphasise the link between contextualisation and relativist/interpretivist approaches to communication. Contextualisation (or ‘socialisation’), which demands communications that are interactional, situational, episodic and improvised (Pacanowsky and O’Donnell-Trujillo 1983), is one way in which the design of hazard assessments can be changed in order to influence their effects. Through the empirical study of effects, it is possible to measure the efficacy of the overall scientific contribution, and thus the strengths and weaknesses of the associations between volcanologists and decision-makers. Nonetheless, it is readily accepted that any measurement of effects may be very difficult in practice. For the purposes of this paper, we argue that the discourse that compares objective/innocent/science-right and constructivist/interpretivist/democratic/right-science approaches to risk communication is incomplete in several ways. It pays insufficient regard to the status of the hazard element of risk – risk being the convolution of elements of hazard, exposure and vulnerability. Within the weak constructivist approach that we adopt, whilst overall risk may be a social construct and susceptible to negotiation using participatory processes (“a subject world”), the natural hazard element is a physical real-world phenomenon (“an object world”) requiring expert scientific assessments, albeit assessments requiring subjective choices (Birkmann et al. 2015, 236). In both theory and practice5, there is therefore a tension between the subjective/normative and objective/descriptive elements of risk (Longino 1993; Schwandt 20006) and, with reference to the terminology of the US/NRC (1996), there is room for conflict between the concepts of “getting the science right”, measured by standards of scientific adequacy, and “getting the right science”, which requires standards of utility. We address the persistent failure by risk governance commentators to investigate methodically and holistically the challenges related to the production and communication of hazard knowledge, having focussed instead upon the negotiated construction and communication of risk, or a single feature of hazard communication such as ‘understandability’ or ‘trust’. Insufficient attention has been given to the drivers of the associations between volcanologists and decision-makers and the possible influence of regulatory and non-scientific pressures. The challenges, to which we refer, raise complex issues of ‘negotiation’, that are demonstrably real, quantifiable and potentially significant, and therefore should be mitigated. Within social constructivist models the concept of risk has at least three overlapping functions. Risks, like hazards, are objects of governance which must be quantified to facilitate their integration for decision-making purposes. Secondly, risk is a methodology by which future volcanic uncertainties can be managed. Thirdly, the methodology of risk has a normative (i.e. ethical) dimension and definable norms, standards and expectations – in other words, quality standards that circumscribe, and direct the conduct appropriate for a given situation. These standards can also be used as tools to monitor performance and apportion blame. ‘Actual conduct’ (including quantifications of the parameters of hazard, exposure and vulnerability) can be measured against ‘right conduct’ in a situation in which a decision-maker must consider numerous possible actions and decide what should be done (IRGC 2009; Ben-Ari and Or-Chen 2009; Walker et al. 2010; Thompson 2012). It follows that risk is the mother of its unintended offspring, the scrutiny dimension that we now introduce. We adopt and build upon the ‘physical’, ‘societal’ and ‘managerial’ dimensions of risk governance identified by Cardona (2004). The last of these, which includes “management capacity and related actors”, determines the need for, and the purpose and nature of, interactions between risk governance stakeholders (Cardona 2004, 477). Specifically, we build on Cardona (2004) by noting there is slow changing context in which risk management takes place, which we refer to as the ‘scrutiny’ dimension. This novel fourth dimension of risk reflects the extent to which decision-makers and their decisions will be scrutinised and influenced by legal and other processes that seek to promote better governance with reference to standards set by, inter alia, international, national and local laws, as well as less formal initiatives and expectations. Laws create a framework of governance to order: (1) behaviour (converting governance policies into outcomes); (2) power (defining structures, duties and rights that distribute responsibilities and power between many stakeholders); and (3) contestation (providing substantive and procedural tools to promote responsibility and accountability and to resolve disputes) (Bretton et al. 2015, 2017; WBG 2017). There are many potential scrutiny sources and they include those detailed in Table 1 that are entirely external to the stakeholders. Six potential sources of regulatory standards are discussed later in this paper and summarised in Table 5.
International human rights and related laws such as those formulated by the European Court of Human Rights. RR initiatives championed by international entities such as the International Federation of Red Cross and Red Crescent Societies (FRC) and the United Nations (UN) Development Programme. National, regional and local laws including primary legislation, secondary regulations and tertiary codes of practice and guidance notes. The Robert T. Stafford Disaster Relief and Emergency Assistance Act 1988 in the USA is an example of national primary regulation. National case law including high profile criminal and civil law court cases. It is the scrutiny dimension that creates management challenges for decision-makers and may influence their associations with, and their demands upon, volcanologists. We adopt the working hypothesis that the requirements of decision-makers change over several different time-scales and that, by means of careful and effective dialogue, they can be identified. In the short-term, the demands may change during the many phases of a cycle of volcanic unrest. Over longer periods, they will change in response to actual and perceived changes in the scrutiny dimension. Insufficient guidance exists for managing the practicalities and standards of contextualisation. We argue that the scrutiny dimension has the potential to be the main influence upon the demands of decision-makers and, thereby, the main agent behind changes to the metastable ‘equilibrium of contextualisation’, which we introduce later. This equilibrium explains the consequences of the absence of commonly recognised standards (norms) capable of guiding, measuring and evolving acceptable practice - standard equivocality - identified by Bretton et al. (2015). There is a rich discourse in the field of volcanic risk governance that identifies many factors that drive the ‘effectiveness’ of communication (Leonard et al. 2014; Donovan and Oppenheimer 2014; Doyle et al. 2015; Christie et al. 2015; Mothes et al. 2015; Scolobig et al. 2017; Preuner et al. 2017). Based on this discourse, we accept as a working assumption that different stakeholders have distinct: (1) capacities; (2) understandings (mental models); and (3) needs and expectations. Effective communications reflect an appreciation of and, are driven by, these differences. Ineffective communication can lead to decision-makers making ill-informed decisions (US/NRC 1996; Solana et al. 2008) with associated direct and indirect consequences. Recent cases, including the L'Aquila case, have shown that legal consequences may flow from communication inadequacies (Lauta 2014a, 2014b; Bretton 2014, Bretton et al. 2015, 2017; Scolobig et al. 2014; Scolobig 2015; Doyle et al. 2015; Alexander 2014a, 2014b; Bretton and Aspinall 2017). We have identified, and seek to integrate within our investigation of contextualisation, eight key factors that are summarised in Table 2. A variety of non-linear modes of communication should be considered and more iterative models refer to, and differentiate between, a wide range of degrees and modes of participation. Arnstein 1969; Gibbons 1994; Ronan et al. 2000; Cornell 2006; Jóhannesdóttir and Gísladóttir 2010; McCall and Peters-Guarin 2012; Bird and Gìsladóttir 2012. The capacity of at-risk individuals, and the duty holders mandated to protect them, within the management contexts within which they must make risk-mitigation decisions. Cardona 2004; UN/ISDR 2015; Scolobig et al. 2017; Preuner et al. 2017. How people understand and think about hazards and risks. Douglas 1992; Cardona 2004; Bostrom 2008; Christie et al. 2015; Scolobig et al. 2017; Preuner et al. 2017. The quality of dialogue between risk management stakeholders, and the provision of information and advice that is relevant to risk-mitigation decisions founded upon a mutual understanding by those stakeholders of: (1) their respective needs, responsibilities, functions, demands and roles, and (2) their capacity to anticipate other stakeholders’ decision-related requirements. Turner et al. 1986; Salas et al. 1994; Newhall et al. 1999; Crichton 1999; Cash et al. 2003; Bankoff et al. 2004; Perry et al. 2008; Newhall et al. 1999; Ronan et al. 2000; Lipshitz et al. 2001; Paton and Jackson 2002; Renn 2008; Jóhannesdóttir and Gísladóttir 2010; Tierney et al. 2001; Doyle and Johnston 2011; Fischhoff 2013; Doyle et al. 2011, 2015; Carreno et al. 2012; Fearnley et al. 2012, Fearnley 2013; Potter et al. 2014; Jolly and Cronin 2014; Christie et al. 2015. The importance of: (1) regular disseminations of information by volcanic hazard assessors (e.g. volcano observatories); and (2) timely exchanges of information, both within and between advisory and decision-making bodies. However, multiple and divergent sources of scientific advice, with associated uncertainties, can stifle decision-making. Mileti and Sorensen 1990; Newhall et al. 1999; Ronan et al. 2000; Haynes et al. 2008a, 2008b, 2008c; Paton 2008; De la Cruz-Reyna and Tilling 2008; IRDR 2011; Doyle et al. 2011; Fearnley et al. 2012; Fearnley 2013; Fischhoff 2013; Potter et al. 2014; Jolly and Cronin 2014. The need for careful consideration of the form and content of hazard communications to minimise any misinterpretation or confusion. A communication should be in a form, and have content, from which sufficient meaning can be extracted by the recipient to make informed decisions. Peterson (1988); Bernknopf et al. 1990; Gibbons et al. 1994; Teigen and Brun 1999; Karelitz and Budescu 2004; Wilson et al. 2007; Cronin 2008; Solana et al. 2008; Haynes et al. 2008a, 2008b, 2008c; Budescu et al. 2009; Joslyn et al. 2009; Visschers et al. 2009; McGuire et al. 2009; Lipkus 2010; Doyle et al. 2011; Fischhoff 2013; Doyle et al. 2014; Potter et al. 2014; Neuberg 2015; Thompson et al. 2015. Trust is an earned attribute and may be affected by many factors. It is important to maintain an authoritative scientific advisory voice that is trusted in fast-moving contexts in which decision makers may be receiving a diverse range of mandated, alternative and unorthodox views as well as solicited and unsolicited advice. Qualities that may enhance trust include reliability, competence, openness and integrity. Renn and Levine 1991; Siegrist and Cvekovich 2000; Frewer et al. 2003; Poortinga and Pidgeon 2003; Poortinga et al. 2004; Siegrist and Gutscher 2006; Hemlin and Rasmussen 2006, 188; Pielke 2007; Wilson et al. 2007; Eiser et al. 2009; Renn 2008; Haynes et al. 2008b; Doyle and Johnston 2011; Fischhoff 2013; Ulusoy 2012; Owen et al. 2013; IAVCEI 2013 Newsletter No. 4; Sparks et al. 2013; Siegrist 2014; Pierson et al. 2014; Potter et al. 2014; Leonard et al. 2014; Donovan and Oppenheimer 2014; Doyle et al. 2015; Christie et al. 2015; Mothes et al. 2015; Scolobig et al. 2017; Preuner et al. 2017. The adequacy of the scientific inputs based upon processes to ensure quality, comprehensiveness, transparency and robustness. The perception that the production of scientific information has been respectful of stakeholders’ divergent values and beliefs, unbiased in its conduct, and fair in its treatment of opposing views and interests. Cash et al. (2003) and Sarrki et al. (2014) adopted by Fearnley and Beaven (2018) in the context of volcano alert systems. These key factors show that communication is more likely to be effective if it is ‘tailored’ to the capacities and needs of its recipients and, accordingly: (1) is relevant to the risk-mitigation decisions that must be made; (2) is received easily and on time; and (3) can be understood and trusted. This tailoring, in other words contextualisation, is an obvious and inevitable response to the managerial dimension of risk governance. It is also evidence of a critical association between volcanologists and decision-makers. The nature and quality of that relationship, and the tailoring it fosters, need to be investigated carefully and are the principal focus of the next section. Using several sub-headings, this section presents and discusses our literature review of the theoretical basis, evolution and practical challenges of contextualisation. It also investigates several aspects of quality assurance. Two extremes of knowledge production can be described and contrasted. Mode-1 products have been described as conventional scholarly reflections that are driven by the motivations of their producers “to get the science right” (US/NRC 1996). Detached from both social context, and political and other values, these products seek to characterise and predict the natural world ‘as it is’, for a separate, sequential, downstream political management response. If any degree of contextualisation is considered, it comes towards the end of a linear process after the completion of analysis, is limited to communication and does not entail an iterative process of deliberation involving science users. Mode-1 science is universal, invariant and abstract. In this context, ‘abstract’ means detached from both social context, and political and other values. It is a product of a closed, isolated, innocent, politically dust-free and sterile environment (Weinberg 1972; Douglas 1992; Beck 1992; Ravetz 1999; Horlick-Jones 1998; Nowotny 2003; Hemlin and Rasmussen 2006). By contrast, Mode-2 products are driven by the requirements of their users. Their production and application are contextualised by co-evolutionary processes of reverse communication (i.e. open dialogue) between producers and users (Weinberg 1992; Hemlin and Rasmussen 2006). Contextualisation involves not only changes of planned outputs and outcomes, but also changes of analytical emphasis and methodology, in other words production decisions (Blockley 1992; Funtowicz and Ravetz 1993; Nowotny 2003). Volcanic risk governance regimes are slowly changing and, perhaps surprisingly, the origins of change can be traced to dates before 1996, when the US/NRC criticised traditional linear models and advocated an analytic-deliberative approach. Since 1984, commentators upon volcanic hazards (including those listed in Additional file 3) have advocated with increasing frequency the merits of contextualising volcanic hazard assessments through processes of deliberation. There is evidence of a slow-moving, disorganised, yet perceptible, paradigm shift from those regimes narrowly based upon linear (i.e. non-deliberative) objectivist and decisionist governance models to more iterative constructivist initiatives that review the benefits and challenges of more stakeholder-focused deliberative processes. Additional file 3 contains a complete time-line of iterative initiatives and associated published literature. “significantly oversimplified the process of volcanic risk management” (Donovan and Oppenheimer 2014, 152). To address the perceived failings of the traditional linear models, many commentators (including those listed in Table 2), without using variations of the word ‘contextualised’, advocate scientific assessments of natural and volcanic hazards that encompass the characteristics listed in Table 3. • capable of independent review. The paradigm shift towards more stakeholder-focused deliberative processes appears to be entirely consistent with our earlier summary of the current theoretical discourse about volcanic risk governance models. Furthermore, the momentum for change is increasing as evidenced by a higher number of published research sources addressing issues consistent with constructivist values and, in particular, those related to the democratic approach to cultural bias and the effectiveness of hazard communications. In Additional file 3, we have identified papers confronting the challenges of participation, stakeholder-needs, contextualisation, comprehensibility, credibility and novel knowledge sources. Closer examination of the academic background of recently-published researchers reveals that: (1) transdisciplinary research projects are becoming more common (e.g. VUELCO; STREVA and DEVORA8); and (2) by inference, research funders accept the relevance and significance of contributions made by social scientists (e.g. the European Union’s Framework programmes, NERC and ESRC). Additional file 3 also demonstrates that the paradigm shift is patchy reflecting the reality that ‘paradigm-challenging’ research projects, with limited budgets, are often confined to small geographical areas and, for obvious reasons, are more common and/or better reported in affluent regions and countries (such as North America, Europe, former European dependencies, and New Zealand). We also acknowledge that, country-by-country, historical and cultural differences may result in different appetites for more democratic governance initiatives. In other words, not all countries with volcanic hazards currently embrace notions of democracy, freedom of information, and active stakeholder dialogue and participation to an equal extent. Another lesson from the review is that there appears to be little or no readily accessible evidence of documented protocols for more iterative processes of volcanic risk governance. We have found no country that has laws and/or binding governance standards that: (1) require the structured contextualisation of volcanic hazard assessments or; (2) lay down, at a more granular level, ‘deliberation’ or ‘participation’ rules or guidance covering matters such as: (a) which stakeholders should be actively involved; (b) when; (c) how; and (d) why; for example by reference to the need to make the satisfaction of the risk-related expectations of decision-makers of primary importance. Although our theoretical choices provide a coherent framework for hazard assessments, they create multiple challenges. These challenges need to be identified and discussed since they are relevant to the practicalities and standards of contextualisation that we consider later. Even though volcanoes exist as ‘objective physical phenomena’, their characterisation can never be simple or a purely objective, value-free and quantitative activity of discovery. Characterisations are social products (Zinn 2008) that are complex, constructed, process-related and dynamic. They are frequently contingent upon existing normative axioms, social conventions and syntax, semantics, and technological pragmatics.9 There are no existing rules that will guarantee the objectivity, truth or reliability of contextualisation (Nowotny 2003). Choices resulting from subjective analysis may become critical within subsequent risk management decisions and may be overlooked (Runge et al. 2015; Leonard et al. 2014). On the other hand, we argue that, when openly identified and discussed, they may represent the variable, or negotiable, aspects of scientific analysis that are integral to, and make contextualisation possible. In short, they may contribute most directly to the utility of the overall analytical effort. We will refer briefly to, but will not develop, the rich discourse that highlights the challenges of constructing suitably comprehensive, and yet comprehensible, knowledge regarding the complex risk-related parameters of volcanic hazards. By way of illustration, since 1997, if not before, there have been lively debates about, inter alia: (1) the differences between ‘predictions’ and ‘forecasts’; (2) the un-achievability of precise prediction; (3) the merits of ‘deterministic’ and ‘probabilistic’ approaches to forecasting; (4) the use of ‘quantitative’ and/or ‘qualitative’ metrics/narratives; and (5) the merits of communicating sources of and estimates of uncertainties alongside the key assumptions underpinning these (Klein 1997; Newhall et al. 1999; Sparks 2003; Sparks and Aspinall 2004; Rausand 2005; Renn 2008; Aven and Renn 2009; Donovan and Oppenheimer 2014; Doorn 2014; Doyle et al. 2014; Stein and Friedrich 2014; Marti 2015; Beven et al. 2015). Many commentators10 have addressed the need for reliability, competence, honesty, openness and integrity when handling the complexities, constraints and subjectivities of traditional scientific analysis.11 Others have stressed the importance of the pre-crisis relationships within which these difficult issues can be discussed and negotiated (e.g. Leonard et al. 2014). We argue that, if the competencies of reasonably competent hazard assessors do not include identifying and responding to the requirements of, and communicating with, decision-makers, any role that involves contextualisation, if and when undertaken, represents a managerial hazard posing possible managerial risks. Risk governance has a critical normative/ethical dimension and, consistent with this conceptual framework, several commentators (e.g. Grabill and Simmons 1998; Van Nuffelen 2004; Hemlin and Rasmussen 2006; Renn 2008; Wachinger and Renn 2010; Thompson 2012) have advocated the need for quality norms for contextualisation.14 Our review of the published literature has identified several common themes regarding the need for, and general character of, quality assurance criteria and these are listed in Table 4. • Facilitate fair and accurate independent review. • Related the competencies needed by scientists for continuous ‘adaptation’ rather than continuous ‘improvement’ during all phases of knowledge production. Weinberg 1972; Bartley 1971; Gibbons et al. 1994; US/NRC 1996; Shackley and Wynne 1996; Grabill and Simmons 1998; Nowotny 2003; Van Nuffelen 2004; Hemlin and Rasmussen 2006; Renn 2008; Hessels and Lente 2008; Wachinger and Renn 2010; Stirling 2010; OECD 2015; Preuner et al. 2017; Scolobig et al. 2017; Papale 2017. The UN’s Sendai Framework prioritised pre-event risk governance and mitigation before post-event response and recovery. It recognised the importance of knowledge building and promoted the utility of quality standards for risk governance developed by technical organisations and experts (UN/ISDR 2015). In summary, to preserve ‘good science’, contextualisation must be actively and rationally constrained within structured boundaries (i.e. protocols, rules and standards) that are the product of an iterative dialogue between stakeholders including experts and decision-makers. Yet, advocates of these boundaries provide little, if any, guidance as to how they can be established and, perhaps unsurprisingly, it has been argued that “novel types of quality control probably constitute the most controversial attribute of Mode-2 knowledge production” (Hessels and Lente 2008, 17). If quality standards are necessary, what standards and processes of standardisation are considered by commentators to be appropriate? Developing the notion of ‘standard equivocality’, we here investigate further the direct and indirect consequences of the scrutinised environment within which decision-makers operate. At least nine sources have the potential to influence the quality norms of contextualisation, and thereby drive the processes, outputs and outcomes of contextualisation. They are characterised here as manifestations of: (1) regulatory standards; (2) natural and operational constraints; and (3) stakeholder pressures. In Fig. 1 we introduce the concept of the ‘equilibrium of contextualisation’ that reflects the product of these influences. In the following discussion we introduce each class of influence separately before considering the effect of ‘standard equivocality’. In this context and for the purposes of this paper, ‘regulation’ means the purposeful control or management of contextualisation that may come in a variety of forms (ranging from slow-changing, rigid, top-down, structured rules to dynamic, organic, bottom-up informal guidance), and from several sources. Six possible sources of regulatory standards are shown in Table 5. Sources, including national and international legal standards, that are situated entirely external to the risk governance stakeholders involved. Further details are in Table 1. Technical and ethical standards determined by bodies of practitioners and experts (e.g. professional self-regulated associations) situated within the risk governance process. Bretton et al. (2015) noted that the International Association of Volcanology and Chemistry (IAVCEI) report entitled “Professional conduct of scientists during volcanic crises” (Newhall et al. 1999) is a rare example of an attempt to issue authoritative 'self-regulating' standards. Standards established by government agencies and other employers that must be followed by individuals due to their contractual employment or engagement. Bretton et al. (2015) differentiate between self-regulation standards and those dictated by employers. Individuals' personal standards based upon moral and ethical codes not dictated by their employers or outside agencies. 'Traditional' standards of methodological probity for Mode-1 science determined by ad hoc communities of disciplinary specialists/peers. These standards were described by Weinberg (1972) and Nowotny (2003) respectively as the “criteria of traditional scientific excellence and quality control” and the “canons of scientific discipline”. Stakeholder-negotiated standards that are the product of iterative processes of deliberation. ‘Natural’ constraints result from the fact that, because “a universal model to understand the behaviour of volcanoes does not exist” (Marti 2015, 372), governance of volcanic risks inevitably involves characterisation of “an inherently complex reality” (Funtowicz and Ravetz 1993, 744). Decision-makers frequently request certainty, agreement and consensus from their advisers, and have their own standards, requirements and expectations that they may seek to impose without open discussion and agreement.21 Unsurprisingly, those same stakeholders may make it perfectly clear what they want to hear from their advisers to suit their overall approach to risk-related issues and risk mitigation.22 Maintenance of traditional standards of scientific probity may therefore be difficult. The ‘equilibrium’ of contextualisation is the product of the regulatory standards, natural and organisational constraints, and decision-maker pressures (i.e. the variables) already referred to. The equilibrium is ‘dynamic’ (or quasi-static) in that, at any moment in time, the influence of variables in one direction is in aggregate balance with any counter-influences (Oxford University Press 2005). It is also ‘metastable’ in the sense that, when influential variables change, there may be resulting ‘disequilibrium’ and ‘imbalance’ and the former state of ‘equilibrium’ and ‘balance’ may be not reinstated. If it is assumed that regulatory standards and natural constraints are relatively constant, the most significant variables are likely to be operational constraints and stakeholder pressures, and, for obvious reasons, these may often be convolved. Rothstein et al. (2006) describe an ‘early stage’ societal risk governance environment with few pressures from external regulation and self-regulation. Under such conditions there are few incentives to proceduralise societal risk governance activities. Governance actions tend to be “ad hoc, methodologically diverse and determined by contingent organisational pressures and ways of working” (Rothstein et al. 2006, 9; Bretton et al. 2015). Adopting Rothstein’s model and for the purposes of this paper, we argue that contextualisation is in ‘equilibrium’ when there is ‘balance’ between the influences of quality standards (regulation), natural and operational constraints (reality) and stakeholder pressures (deregulation). Balance is achieved when regulatory sources are effective, quality standards are unequivocal and enforced, within natural and operational constraints stakeholder pressures are addressed, and structured contextualisation preserves scientific methodologies and probity. The L’Aquila trial highlights the practical difficulties of contextualisation. Alexander (2014a)23 has analysed the influence of multiple cultural, political, social and scientific factors before, during and after the disaster, and the complexities of risk governance regimes involving government entities at national, regional and local levels (Alexander 2010, 2013, 2014a, 2014b; Gabrielli and Bucci 2014). Butti (2016) records that Italy’s Appeal Court noted that science communication plays a key role in public safety management. Accordingly, that court accepted that communicators of scientific knowledge have a legal duty to make communications of science “transparent and precise in their content as well as clear and understandable in their style” (Butti 2016). On the facts determined by the lower court, the Appeal Court confirmed that the public officer, who acted as the science communicator, was guilty of “negligence and imprudence” in making a series of reassuring and unnecessarily informal comments to a television journalist, before a meeting of experts, and inviting at-risk people to toast with a famous local wine. The L’Aquila prosecution was based on alleged facts consistent with a triumph of ‘stakeholder pressures’ (i.e. scientists saying what influential stakeholders wanted them to say) over ‘expert regulation’ (i.e. scientists saying what independent experts would consider was justified by the available scientific evidence and in the light of tried and tested scientific methodologies) in the absence of binding or influential regulation. In summary, it was alleged that a hazard communication had breached standards of contextualisation required by Italian criminal law – binding standards, which were capable of identification at the trial but, for several reasons, were either unknown or ineffective before the tragedy. As illustrated in Fig. 1, we conclude that ‘disequilibrium’ and ‘imbalance’ may result when regulatory sources are ineffective, quality standards are equivocal or unenforced, within natural and operational constraints stakeholder pressures are not addressed, and ad hoc contextualisation fails to preserve traditional standards of scientific probity. We argue that contextualisation, when properly used, is the negotiated product of open and transparent deliberation with stakeholders for the purpose of their risk-related uses. Accordingly, it does not include the covert, intentional or reckless manipulation of the content and/or timing of hazard communications in order: (1) to influence the nature and/or timing of the choices that must be made by risk mitigation decision-makers between multiple possible actions; (2) to reflect the interests of commercial, ideological, religious or local communities; or (3) to incorporate precautionary, conservative, ‘blame-related’ or tactical considerations. In this regard, we appreciate that there is a fine dividing line between, on the one hand, contributing towards the characterisation of the temporal, spatial and physical parameters of volcanic hazards and the identification and assessment of a ‘range’ of related hazard-informed risk mitigation ‘options’ and, on the other hand, actively advocating or influencing ‘particular’ risk mitigation ‘decisions’ that depend inevitably upon socio-political factors, contexts, values and benefit/burden trade-offs. Our theoretical choices provide a reasoned foundation for contextualised hazard assessments at the volcanic hazard-risk interface. We argue that contextualisations conducted by volcanologists must be carefully constrained within negotiated boundaries assured by quality processes and standards, and make specific recommendations to facilitate a more structured approach. to identify, record and foster relationships between volcanologists and the stakeholders that use their services, and to enhance the status and utility of those services. Fischhoff (2013, 14037) suggests that communication is adequate if it meets materiality, proximity, and comprehensibility standards (see Table 2 for further details of these factors and others discussed in this paragraph). Based upon our review of the discourse focussing upon the characteristics of hazard communication, we have concluded that communications should recognise and foster key relationships, and thereby generate shared understandings (i.e. mental models) and constructive sentiments of trust and confidence. We therefore advocate a fourth ‘integrity’ standard that would: (1) complement Fischhoff’s three standards; (2) incorporate the qualities of credibility and legitimacy favoured by Cash et al. (2003) and Sarrki et al. (2014); and (3) provide a more complete suite of standards to monitor, audit; and, if possible, enhance the overall quality of hazard assessments. We have struggled with the need for a fifth standard to safeguard those values perceived as critical to ‘reliable’ scientific analysis. To resolve this dilemma, we revisited the commentaries of those who wish to preserve certain values attributed by them to the rigour, reliability and robustness of the disciplines of Mode-1 science. Their lexicon alluded to notions of detachment, dis-interestedness, autonomy, objectivity and self-restraint. We have concluded that a fifth standard would be cumbersome and is unnecessary as Mode-1 science methodologies and behaviours can addressed adequately by, and are in fact integral to, more granular criteria that would properly form the substance of an integrity standard. To put it another way, most, if not all, of the qualities that are likely to be valued by decision-makers (such as competence, comprehensiveness, robustness, objectivity, fairness, transparency, openness and reliability) are hallmarks of integrity, and the building blocks of trust, legitimacy and credibility. We accept that the utility of scientific knowledge should be established by the continuous quality ‘monitoring’ of not only ‘outputs’ (i.e. knowledge products) but also quality ‘assuring’ the knowledge production ‘processes’ that are claimed to be scientific. Accordingly, quality assurance has a remit that reaches beyond analytical ‘output’ improvement and includes continuous analytical ‘process’ adaption. We thus advocate the four quality assurance standards detailed in Table 6. A weak social constructivist approach to risk governance, which embraces relativist knowledge communication, provides a coherent theoretical framework for the communication of unavoidable scientific complexities and uncertainties at the volcanic hazard-risk interface. Within an iterative, non-linear, analytic-deliberative model, the communication of knowledge is integral to all parts of governance, and the capacities, expectations, sentiments and actions of decision-makers thus become not just relevant but paramount. Assessments of volcanic hazards should no longer assume an intrinsic status or functional role. Any status or role should reflect the existence and qualities of ‘relationships’ between volcanologists and decision-makers, and be derived from, and a consequence of, the subsequent sentiments and behaviours of decision-makers. If it is accepted that decision-makers and their knowledge requirements are important, hazard assessments must be contextualised to make them more risk-decision focussed. If they are not already open post-L'Aquila, the black boxes of hazard analysis and communication must be opened so that their respective roles and risk-governance impacts can be reappraised. Although there is evidence of a slow shift towards initiatives assessing more iterative forms of governance, the processes of deliberation being used seem to lack formal recorded structures. Insufficient guidance exists for managing the practicalities and standards of hazard contextualisation and, to investigate these issues, we introduce two novel concepts. The ‘scrutiny dimension’ of risk governance is the slow-changing regulatory context that may influence the ‘managerial dimension’ of risk and, thereby, the dynamics of contextualisation. The metastable ‘equilibrium of contextualisation’ explains the consequences of the quality ‘standard equivocality’ identified by Bretton et al. (2015). To preserve core values of traditional scientific probity, many commentators have argued that contextualisation conducted by scientists must be constrained within certain boundaries. They have given little, if any, guidance as to how these boundaries can be established, however. In response to the challenge posed by this lacuna, we argue that the working practices of contextualisation must be more structured, and should strive to be open, transparent and fully articulated. Contextualisation, that meets our proposed quality assurance standards of materiality, proximity, comprehensibility and integrity may enhance hazard assessments and, thereby, the utility of their applications (outputs) and impact of those outputs (outcomes). Utility and impact should be measured by reference to the sentiments and actions of decision-makers. Analyses of the past and present, and statements regarding the future, are very difficult because “a universal model to understand behaviour of volcanoes does not exist” (Marti 2015, 372). “Each volcano has its own peculiarities depending on magma variables…rock rheology, stress field, geodynamic environment and local geology” (Marti 2015, 372). Even though volcanoes are notoriously individualistic, with ‘Jekyll and Hyde’ personalities, past volcanic activity is not always a good guide to the future (Fournier d'Albe 1979; Francis and Oppenheimer 2004; Sparks et al. 2013). E.g. those involving data sources and key value assumptions, models, conditions, constraints and limitations. Our choices are made at a time when objectivist and decisionist approaches to risk governance, which are based upon the assumption of an achievable segregation of ‘context and value-free’ and ‘context and value-rich’ domains, are under pressure (Fischer 2000; Pielke 2004; IRGC 2005; Renn 2008; Millstone 2009). Specifically, the current role of volcanologists, when acting as hazard analysts, appears to some commentators from both general scientific and geo-scientific backgrounds to be divisive, blurred, porous and confused (Peterson 1996; Nowotny 2003; Renn 2008; Ronan et al. 2000; Stirling 2010; Donovan and Oppenheimer 2012; Marzocchi et al. 2012; Donovan and Oppenheimer 2014; Bretton et al. 2015; OECD 2015). Citing Longino (1993), Schwandt refers to problem of uniting the descriptive and the normative and describes weak constructivism as “modest contextual empiricism” – one in which the real world constrains our knowledge construction (Schwandt 2000, 199). These three [dimensions of risk] all contribute to attempts to estimate or grade risk. In risk analysis, the context (management capacity and related actors) determines the limits, the reasons, the purpose and the interactions to be considered. Analysis has to be congruent with the context and this must be taken into account when analysing the sum of the contributing factors. If not, the analysis would be totally irrelevant or useless (Cardona 2004, 47). DEVORA is a multi-agency, multi-disciplinary collaborative research programme which is led by volcanologists at the University of Auckland and GNS Science. Weinberg 1972; Freudenburg 1988; Horlick-Jones 1998; Funtowicz and Ravetz 1990; Wynne 1992; Funtowicz and Ravetz 1992; Gibbons et al. 1994; Laudan 1996; Bruijn and ten Heuvelhof 1999; Lupton 1999; Van Asselt and Rotmans 2002; Jasanoff 2002; Merz and Thieken 2005; IRGC 2005; Renn 2008; Mellor 2008; Parascandola 2010; Jasanoff 2010; Spieghalter and Riesch 2011; Aspinall and Cooke 2013; Rougier 2013; Rougier and Beven 2013; Hincks et al. 2014; Cornell and Jackson 2013; Freer et al. 2013; Beven et al. 2015; OECD 2015. Pierson et al. (2014, 21), citing Pielke (2007), Haynes et al. (2008b), argue that four qualities exhibited by scientists enhance their trustworthiness in the eyes of the public. These are: (1) reliability (i.e. consistency and dependability in what they say), (2) competence (i.e. having the skills and ability to do the job); (3) openness (i.e. having a relaxed, straightforward attitude and being able to mix well and become ‘part of the community’); and (4) integrity (i.e. having an impartial and independent stance). On a similar note, the OECD (2015, 34) noted “it should be recognised that openness and transparency are important elements in maintaining public trust in scientific advice during crises”. Van Nuffelen (2004) refers to “inevitable communication problems” and the practical and cognitive difficulties of “scholastic distortion”. These norms have been referred to as rules for how science is conducted (Grabill and Simmons 1998), an ethical threshold for scientific investigation (Van Nuffelen 2004), commonly agreed standards of validation (Renn 2008), benchmarks and performance standards (Hemlin and Rasmussen 2006), and integration rules and standards (Wachinger and Renn 2010). The US/NRC's definition of analysis expressly acknowledges that there may be “strong practical reasons for standardised, replicable and defensible analytic procedures…capable of independent review” (US/NRC 1996 102). On a similar note, Renn (2008) states that analytical competence is typically evaluated by criteria and established rules that have been developed within the respective disciplines from which the analytical theories and methods originate. Renn (2008) is more specific arguing that deliberation can assist scientific analysis in several ways. Deliberation can enhance analysis by incorporating information from disparate sources including local, indigenous, experiential and circumstantial knowledge sources Such as those championed by Baxter et al. (1998), Loughlin et al. (2002), Cronin et al. (2004a, 2004b), Cashman and Giordano (2008), Mercer and Kelman (2010), McCall and Peters-Guarin (2012), Cornell and Jackson (2013) and Pardo et al. (2015); representing an indirect endorsement of our materiality and integrity standards. Deliberation can determine what kind of analysis a risk-mitigation decision requires (a direct reference to the need for materiality), and whether that analysis is appropriately balanced (an indirect reference to a need for integrity). Lastly, deliberation can determine how to communicate “user–friendly” (i.e. bespoke as opposed to one-size-fits all) analytical results – an indirect reference to our materiality, comprehensibility and proximity standards. Renn (2008, 275) refers to evidence claims, such as hazard communications, being “fairly and accurately tested against commonly agreed standards of validation”. The US/NRC's definition of analysis, summarised in [Additional file 1], expressly acknowledges that there may be “strong practical reasons for standardised, replicable and defensible analytic procedures…capable of independent review”. Addressing the same issue, other commentators refer to the “maturity of scientific knowledge” and acknowledge that many “decision options require systematic knowledge that is not available, still in its infancy or in an intermediate status” (Renn 2008, 292; Starr and Whipple 1980; Horlick-Jones 1998; Horlick-Jones 2007). In apparent support for the above sentiments, and to put in context their recommendations for volcanic hazard map standards, it is telling that Leonard et al. (2014) noted a lack of relevant authoritative international guidance in their 2012 Tongariro eruption crisis case study. Weinberg (1992) refers to the need for ‘engineering judgement’ when decisions must be made on incomplete data and constrained by time and resource limitations. A judgement of this nature is a good example of unstructured contextualisation; however, great care must be taken to distinguish between, and not to misuse, the terms ‘engineering judgement’ and ‘expert judgement’. The latter is not arbitrary, having to satisfy various fundamental principles (Skipp 1993). By way of illustration, it might be agreed that it would be appropriate to prioritise certain analytical activities, and/or to target areas of greatest perceived societal risk exposure or vulnerability, such as a particular valley, an area of high population/vulnerability, or critical infrastructure sites (e.g. a bridge, dam, desalination plant, hospital or airport).For contextualised communication, the issues to be addressed would include: (1) analytical content – format, numerical and narrative expressions of probability and analytical confidence, assumptions, jargon and graphics; (2) ancillary advice – the adequacy, location and funding of monitoring resources, hazard and risk mitigation and monitoring safety; and (3) delivery – timing, means, givers and receivers (see e.g. Jolly and Cronin 2014). (McGuire and Kilburn 1997; Paton et al. 1998, 1999, 2000; WBGU 2000; Aspinall 2011; Donovan and Oppenheimer 2012; Jolly and Cronin 2014). Stirling (2010) notes that policy-makers often prefer expert advice presented as a “single ‘definitive’ interpretation”. He warns that, in response, there is a tendency for scientists to reach and present a consensus opinion and, not only to understate uncertainties within quantitative advice, but to present qualitative advice that understates ambiguities and ignorance, and contains aggregated beliefs. We are very grateful for critical feedback and constructive criticism from Professor Sir Stephen Sparks and Dr Sue Loughlin, who were RB’s PhD examiners and thereby considered an early version of this paper. Candid and very detailed critiques from Chris Newhall and four reviewers greatly enhanced its final version. We also thank Dr Al Tanner who assisted with the design of the figure. The research leading to this paper received funding from the European Union’s Seventh Framework Programme (FP7/2007-2013) under grant agreement No. 282759 ‘VUELCO’. Supplemental material is included in three additional files. RB undertook the research and most of the related analysis and manuscript drafting. JG, RC contributed to the overall structuring and purpose of the paper and its methodology, findings and conclusions. All authors edited, read and approved the final manuscript. RB graduated from UOB with an LLB (Hons) Law degree in 1975 and has practised as a UK lawyer since 1978. For most of his career he was a litigation solicitor specialising in regulatory law – in particular, occupational health and safety law compliance - and, in later years, the defence of criminal prosecutions against utility companies following serious accidents and fatalities. In 2009 RB returned to UOB graduating with a BSc (Hons) in Geology in 2012 and a PhD in 2017. His PhD thesis was entitled “Hazard Communication by Volcanologists: The case for contextualisation and related quality standards”. RB has the unusual, if not unique, distinction of over 39 years’ experience of legal practice in the relevant field of regulatory law (health & safety) supplemented by more recent academic qualifications in geology. Bartley RL. "When Science Tangles with Politics", Congress lomIl. Record, v. 117, no. 151. 12 October 1971, pp. S16173–16174. https://files.eric.ed.gov/fulltext/ED059074.pdf. G8 (2005) Gleneagles Response to the Indian Ocean Disaster, and Future Action on Disaster Risk Reduction: Statement. http://www.commit4africa.org/content/gleneagles-g8-response-indian-ocean-disaster-and-future-action-disaster-risk-reduction. Stein S, Friedrich A. How much can we clear the crystal ball? A & G. 2014;55(2) https://doi.org/10.1093/astrogeo/atu089. Thompson MA, Lindsay JM, Gaillard JC. The influence of probabilistic volcanic hazard map properties on hazard communication. Journal of Appl Volcanol. 2015;4(1):6. https://doi.org/10.1186/s13617-015-0023-0. Walker G, Whittle R, Medd W, Watson N. Risk Governance and natural hazards, Cap Haz-Net WP2 Report, Lancaster Environment Centre, Lancaster University, Lancaster; 2010. http://caphaz-net.org/outcomesresults/CapHaz-Net_WP2_Risk-Governance.pdf.